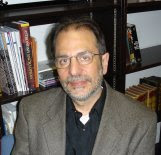 [This is an invited article based on recent works of the authors. In most metals and semiconductors, the motion of an electron is well described by the Schrödinger equation. The kinetic energy increases as the square of the momentum just as for electrons in vacuum (Fig. 1a). However, in certain materials, the electronic energy increases linearly with the momentum (Fig. 1b). The linear dispersion is reminiscent of that of neutrinos and photons. Examples of such materials are graphene  (a single layer of carbon peeled from graphite), bismuth and antimony and their alloy BiSb, and a class of organic metals called “ET” salts. The quasiparticles (broken Cooper pairs) in the unconventional superconductors based on copper oxide and on strontium ruthenate also display a linear dispersion. In these “Dirac materials”, the electrons are accurately described by the Dirac Hamiltonian, except that the effective velocity of light is reduced by a factor of about 300. The effective fine structure constant is roughly 3 instead of 1/137. In comparison with relativistic electrons in vacuum, Dirac electrons living in solids have several distinguishing features. First, a magnetic field of a few Tesla is sufficient to quantize the orbits of Dirac electrons to form a series of Landau levels. To obtain similar effects in relativistic electrons in vacuum, one would need magnetic fields in excess of a million Tesla. As the applied field is increased, the Landau levels are successively emptied. This leads to the well-known quantum oscillations in curves of the resistivity and magnetization versus field (Fig. 1c) (the periods of these oscillations are routinely used to measure the caliper of Fermi Surfaces). If the field is strong enough, all the Dirac electrons are forced into the lowest Landau Level. In this situation, the effects of mutual Coulomb repulsion between the electrons are greatly enhanced. This is particularly true for Dirac electrons which (unlike the Schrödinger case) do a poor job of screening each other’s Coulomb potential. Secondly, in solids, Dirac electrons occupy distinct but equivalent Fermi Surface pockets or “valleys”. The additional degree of freedom, akin to “flavor” in particle physics, is known as valley degeneracy. These ingredients suggest that, in a steadily increasing magnetic field, Dirac electrons may undergo a sudden phase transition to a collective state in order to relief the effects of mutual repulsion. The Fermi surface of bismuth is comprised in part of 3 equivalent electron ellipsoids which are accurately described as Dirac electrons (the Fermi Surface encloses all occupied states in momentum space). Hence bismuth presents a gas of Dirac electrons which come in 3 flavors, corresponding to the 3 ellipsoids. The electrons coexist with an equal concentration of holes, which are positively charged carriers obeying the ordinary Schrödinger equation. If the electrons can be studied free from interference from the holes, we could investigate the question posed. Unfortunately, Nature has diabolically arranged matters so that the interference from the holes is a maximum when the magnetic field is pointed along the most interesting direction -- the trigonal axes (along this axis, strict equivalency between the 3 electron flavors is maintained). In this field direction, the period of the quantum oscillations is nearly the same for both holes and electrons. Because the hole oscillations have a larger amplitude, they completely obscure the electron oscillations. For 4 decades, this has prevented researchers from “seeing” what the Dirac electrons are doing in a magnetic field. In Ref. 2, we extended torque magnetometry, a technique pioneered by David Shoenberg, to fields of 32 Tesla. In bismuth, the dynamics of the electrons are conveniently described in terms of effective-mass parameters which assume different values along the 3 symmetry axes. If the magnetic field is tilted at an angle to a symmetry axis, the mass anisotropy leads to a magnetic moment that is at an angle to the field. This immediately leads to a torque on the sample. As shown by Shoenberg, the torque signal provides a remarkably sensitive way to detect individual Landau Levels as they cross the chemical potential. By careful choice of the torque axes, we were able to tease out the torque signals of the Dirac electrons and distinguish them from the holes (see the low-field regions in Fig. 2). This solved the problem mentioned. Fig. 1a: Quadratic energy dispersion of electrons obeying Schrödinger equation. Fig. 1b: Linear dispersion of Dirac electrons. Fig. 1c: Curves of the torque signal versus magnetic field in bismuth at 0.3 K at selected tilt angles of the field to the trigonal axis. Rapid oscillations at low fields are Landau Level crossings. The red and black arrows indicate sharp electronic transitions to a collective state . With the ability to see what the Dirac electrons are doing, we proceeded to investigate their behavior in an intense magnetic field aligned nearly parallel with the trigonal axis. We found that at low temperature (below 2 K), the electrons exhibit a sharp transition to a collective state (red arrows in Fig. 1c). In contrast with the torque signal at lower fields which are replete with Landau oscillations (Fig. 2), the torque flat lines at a value close to zero above the transition field. In this region, which extends to very high fields over a narrow range of tilt angles, Landau levels are completely absent (upper right quadrant of Fig. 2). We have dubbed this the “dead zone”. Interestingly, when we exit the dead zone by further increasing the field at a finite tilt angle (see black arrows in Fig. 1c), the remaining Landau levels reappear. Fig. 2 Curves of the derivative of the torque signal versus magnetic field at selected tilt angles q . Peaks (labeled by 1+ or 0-) occur when Landau Levels cross the chemical potential. In the dead zone (upper right quadrant bounded by the gray curve), the curves assume flat-line behavior. What is the state in the dead zone? Our best guess is that the Dirac electrons have transitioned to a collective state in which their total Coulomb energy is dramatically lowered. We may draw an analogy with ferromagnetism. In an ordinary metal, each electron can align its spin up or down. If the Coulomb repulsion is large compared with the kinetic energy, the electrons transition to the ferromagnetic state in which all spins are aligned up (say). The Pauli Principle then guarantees that the electrons are always kept maximally apart from each other. This results in a large lowering of the mutual repulsion energy (at the price of a small increase in kinetic energy). The 3 equivalent valleys for the Dirac electrons in bismuth constitute a degree of freedom that mimics the spin degree in a ferromagnet. We propose that, in the dead zone, all Dirac electrons occupy one of the valleys (or a linear combination of the 3) so that they can stay maximally apart from each other. This collective state, dubbed “valley ferromagnetism”, was previously proposed for bilayer GaAs in the quantum Hall effect state . The present results share a common thread with recent developments in several areas of condensed matter physics. The Dirac electrons in (2 dimensional) graphene occupy 2 equivalent valleys. There is recent evidence  that, in an intense field, they also undergo a phase transition to a high-field state in which the degeneracy between the 2 valleys is lifted. Interesting Dirac states are predicted to exist on a 2D interface separating regions in which the Dirac mass has opposite signs. The massless Dirac states at the interface are chiral, i.e. they propagate in only one direction depending on the spin. The recent prediction  of quantized spin Hall currents carried by these chiral states has received strong support from experiments  on HgTe quantum wells. 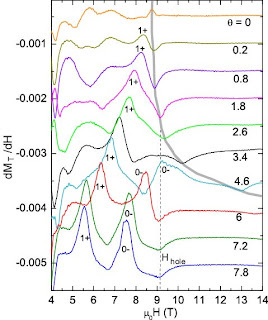 The 3-dimensional alloy Bi-Sb has recently drawn strong interest because of the prediction  that it harbors surface Dirac states that are chiral as well as “topological” in nature. Using angle-resolved photomission spectroscopy (ARPES), Hasan and collaborators recently observed directly the surface states . Very recent spin-resolved ARPES experiments have confirmed the unique spin polarization of the surface states in both pure Sb and Bi-Sb . Lastly, the possibility of Majorana fermions living at the edge of a p-wave superconductor has been discussed but the experimental situation is still uncertain. "Electric Field Effect in Atomically Thin Carbon Films", K. S. Novoselov, A. K. Geim, S. V. Morozov, D. Jiang, Y. Zhang, S. V. Dubonos, I. V. Grigorieva, A. A. Firsov, Science 306, 666 (2004). Abstract. 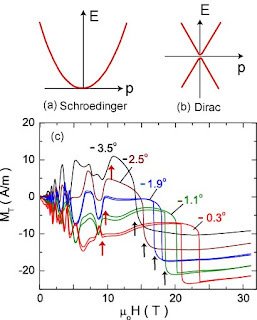 “Phase transitions of Dirac electrons in bismuth”, Lu Li, J. G. Checkelsky, Y.S. Hor, C. Uher, A. F. Hebard, R. J. Cava and N. P. Ong, Science 321, 547 (2008). Abstract. “Spontaneous interlayer coherence in double-layer quantum Hall systems: Charged vortices and Kosterlitz-Thouless phase transitions,” K. Moon, H. Mori, Kun Yang, S. M. Girvin, A. H. MacDonald, L. Zheng, D. Yoshioka, Shou-Cheng Zhang, Phys. Rev. B 51, 5138 (1995). Abstract. "Zero-Energy State in Graphene in a High Magnetic Field". Joseph G. Checkelsky, Lu Li, and N. P. Ong, Phys. Rev. Lett. 100, 206801 (2008). Abstract. “Quantum Spin Hall Effect and Topological Phase Transition in HgTe Quantum Wells”, B.A. Bernevig, T.L. Hughes and S.–C. 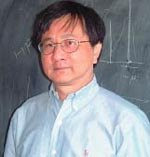 Zhang, Science, 314, 1757-1761 (2006). Abstract. “Quantum Spin Hall Insulator State in HgTe Quantum Wells”, M. König, S. Wiedmann, C. Brüne, A. Roth, H. Buhmann, L. W. Molenkamp, X. L. Qi, and S. C. Zhang, Science 318, 766 (2007). Abstract. L. Fu and C.L. Kane, Phys. Rev. B, 76, 045302 (2007). Abstract. Nature 452, 970 (2008). Abstract. M. Z. Hasan, private communication.